We provide miles of smiles with the best quality face and body art to add that WOW factor and a blast of fun! We arrive on site before the event for set up and ensure we are ready to make magic for you and your guests on time and in a professional manner! All the photos on this site are of work done by Kim Brennan and most of the patterns are original artworks! We use only the best and safest materials for your home parties, corporate events and fund raisers! **Theme and special choices for birthday parties for all sizes and ages! Kids, kids, kids! Big and small, come one come all! From characters like Minecraft and My Little Pony to the favorites like Iron Man, Ninja Turtles, Batman and Spidey! Make sure those photo memories include safe, clean and quality artwork and avoid the smeary mess and questionable products! Only the best for your guests! **We also offer Temptu(tm) Tattoos alcohol based body paints which last between 1 - 7 days. The Temptu can be removed with rubbing alcohol or be allowed to simply wear off. Great for theatre and television or to fool a friend! Looks real! **FREE HAND or stencil glitter tattoos are also available upon request - freehand is beautiful and individual - NO STENCILS! Real art that glitters and can last as long as 7 days!! Stencils are also available for younger clients and those that have specific themes and characters in mind. Stencils can be created just for your event upon request such as team logos but there must be a minimum of 4 weeks notice! **Airbrush tattoos (Freehand and stencil) This will require a sheltered area with power for the air compressor. You may opt for compressed air if power is not available or noise is an issue. Compressed air has an additional $30 charge. 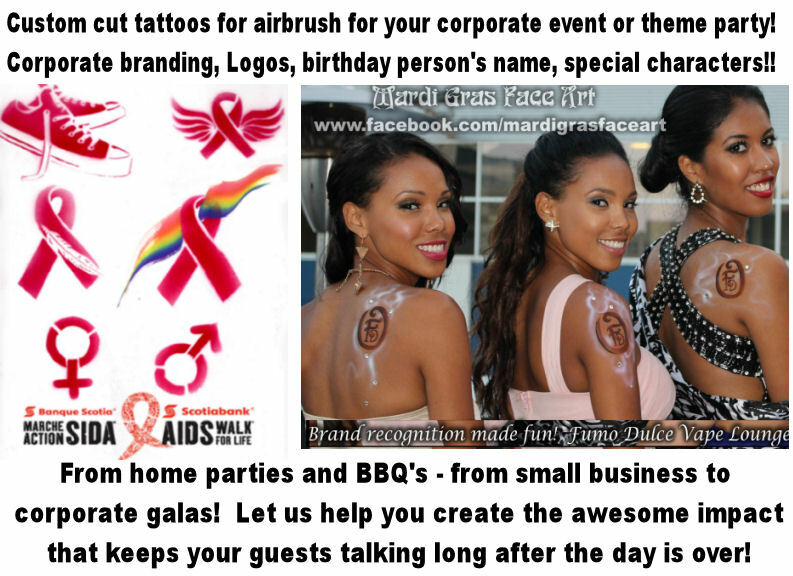 Custom business and logo service to put your event over the top!!! **If you would like to know more about our exclusive henna services, please go to http://www.winnipeghenna.com to view television interviews, news paper articles and full portfolio. Although Cheap face painting is not good and Good face painting is not cheap,we strive to make this wonderful art form accessible to everyone! Hourly Events - $85 - $125/hour. This rate applies to birthdays, fairs, Holiday celebrations, grand openings, customer appreciation and corporate events. Small birthday parties are $165 for two hours! There is a 2 hour minimum and events longer than 2 hours may qualify for discounted additional hours. This is your treat for your very lucky guests! Special Guest appearances at events - Possible No cost. I do several charity event and there are so many great causes and charities that I would love to support but it would be impossible to donate time and materials for free to all of them so there are different options for these requests. I arrive either at your home or on location at your photographer's studio to create your special design and you can then capture it for amazing memories to treasure! At no additional charge I bring my own camera to capture the moment and ensure you get edited and unedited files to print or email as you like! Time limit does not apply. Please enquire personally as every request and requirement is different. Personal sitting starts at $25 no matter what the design or time to apply. These are booked in advance. *** If you are interested in our Annual Halloween Open House to get your party paint on to win those contests, please book far in advance. This books up very quickly. **Travel charges may apply outside of a 10km radius of the artist's location. Although your name is not mandatory, it's always nice to know who we are speaking with! Please do include your first name! Thank you! A valid email is necessary in order to be able to contact you regarding your enquiry! Please ensure it is correct! If you do not hear from us within 48 hours, please try us again! Thank you! Please include times, dates and contact phone numbers so we may best serve you! After you hit the 'submit' button you will be returned to the 'Home' page. We look forward to being able to entertain with art at your event! All pictures and text composition are property of Mardi Gras Face Art™. Winnipeg Face Paint with appearances world wide and as seen in the Winnipeg Sun, Free Press and teaching world wide!